Sennheiser Clip-On In-Ear Adapter, Ear Hook and Ear Buds for SD Office and D10 Series | Avcomm Solutions, Inc.
Accessory set including earhook with leatherette sleeve, earbuds (S, M, L) and a click-on adapter for the Officerunner, SD Office & D 10 series. The HSA 20 ear hook accessory set is designed to offer an improved, flexible and perfect fit to the already existing Officerunner, SD Office and D 10 headsets. 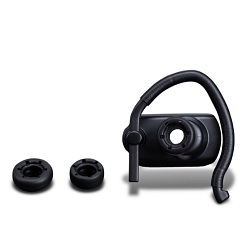 The click-on adapter is used for mounting the ear hook featuring a soft leatherette sleeve on the headsets. Improved noise isolation and a secure fit is offered with in–ear earbuds in 3 different sizes (S, M, L) that are mounted on the adapter for the perfect individual fit and optimal wearing comfort. •Improved noise isolation and perfect fit – with in-ear earbuds in three sizes. •Intuitive and flexible solution – as the earhook can be rotated in two directions and its height adjusted in order to accommodate a wide range of ear shapes and sizes. •Optimal wearing comfort - with soft leatherette sleeved earhook and in-ear earbuds.